From Denver, drive west on I-70 towards Grand Junction. Cross Vail Pass and drive downhill towards the ski resort Vail. Take exit 176 (Vail), measure from the traffic circle serving this exit. Continue one mile west on the parallel road on the right hand side of the interstate. Turn right onto Red Sandstone Road. Pay attention as you need to keep left at mile 1.6 where the paved road makes a sharp bend. You are now on a dirt road. This dirt road may be driven by ordinary cars, but slowly, due to many potholes at its upper section. At mile 4.3, turn left onto Piney Lake Road. Keep rigfht at mile 8.0, then right again at mile 8.1. Follow signs for Piney Lake. 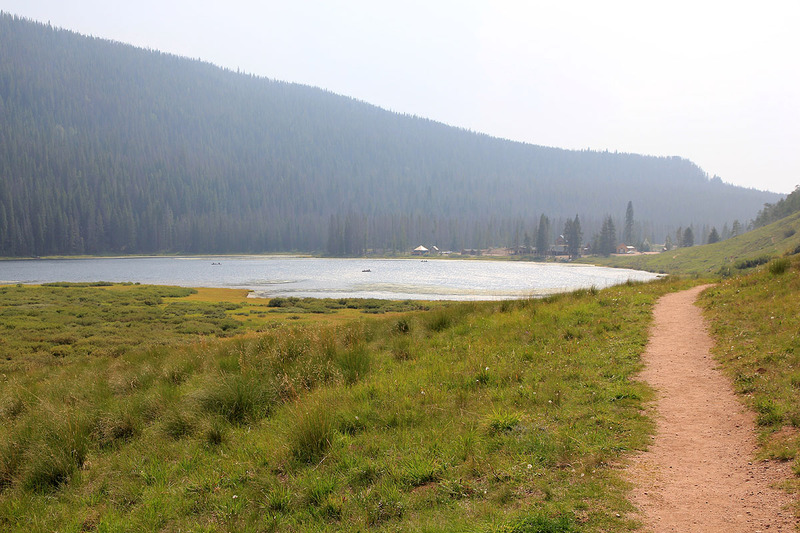 At mile 10.6, you cross the creek on a bridge, then immediately turn right for Piney Lake. 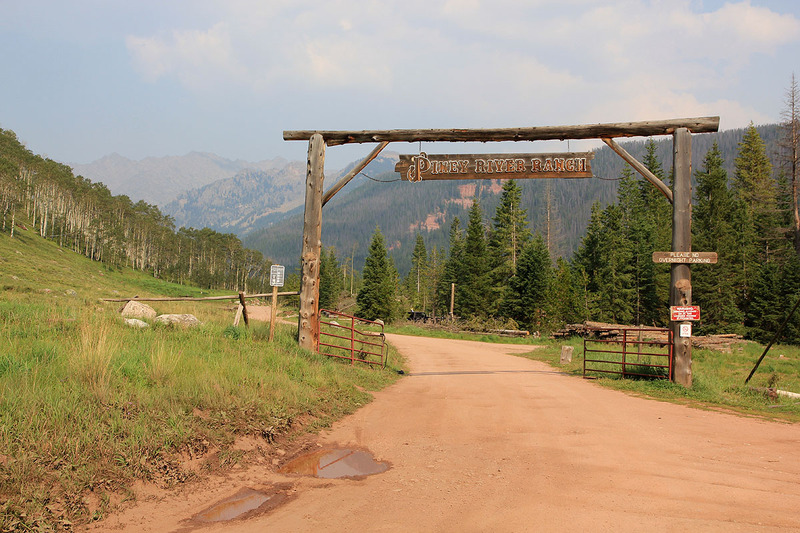 You will arrive at the gate of Piney Lake Ranch at mile 12. There is trailhead parking immediately to the right of the ranch entrance. This location is N39.72024, W106.40532, elevation about 2860 meter. 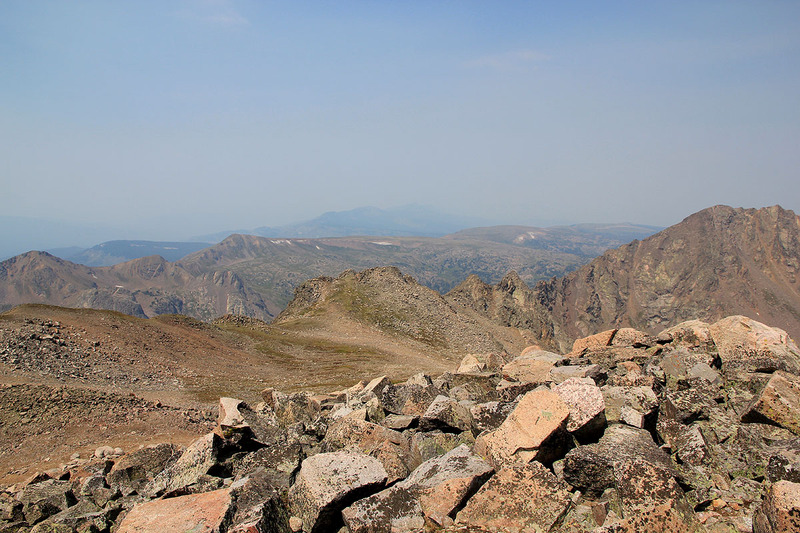 Mount Powell is located in the Gore range, a wild and rugged area between Silverthorne and Vail, north of I-70. 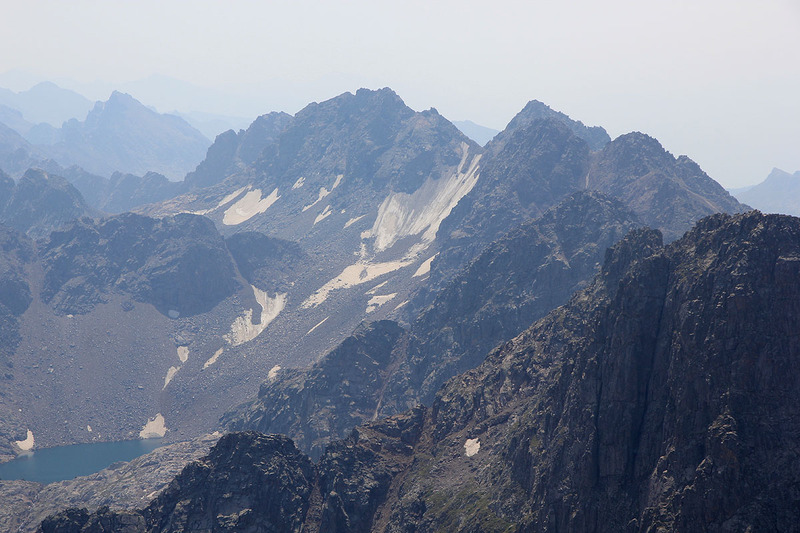 The main peaks in this range have been named by alphabet letters, a few have a proper name as well. Mount Powell is the highest in the range and "Peak B" by this general scheme. From the trailhead, go back across the road in front of the ranch entrance, then proceed following a (signed) bypass trail that circumvents the central ranch area. This part of the trail crosses ranch property and gives access to the wilderness further into the valley. The ranch owners should be commended for this, they certainly serve as a good example of how one can enjoy private property while still making access for the public. 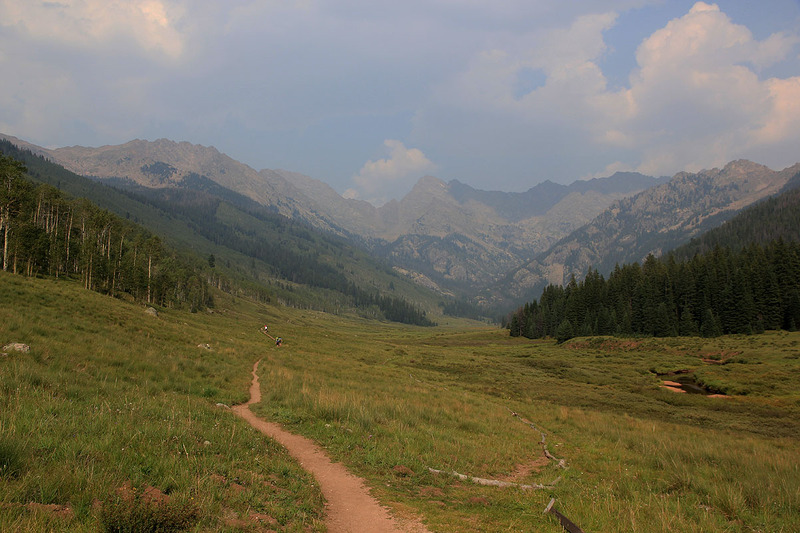 The trail runs in the valley and passes Piney Lake on its left side. 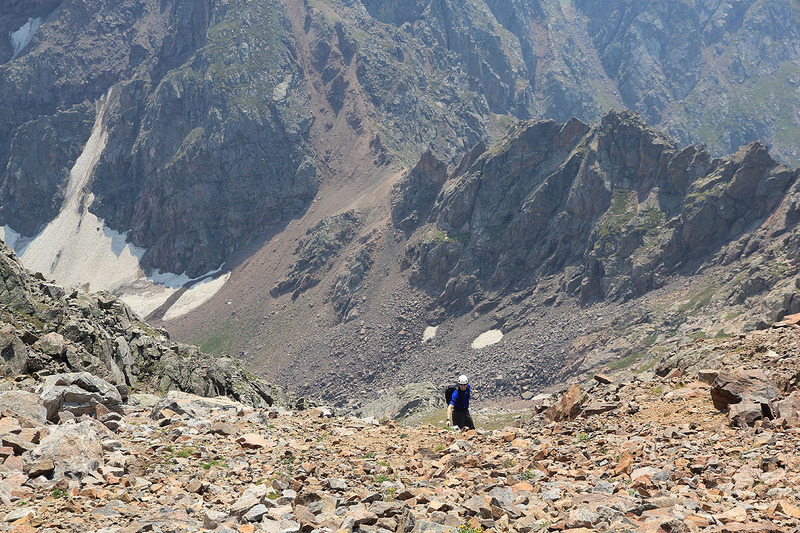 Further onwards, the trail climbs a bit higher while still heading up the main valley. Eventually, after a slight descent, the Piney Creek Trail is again near the creek. From here, the route shall climb left, staying left of the smaller creek that drains this side valley. 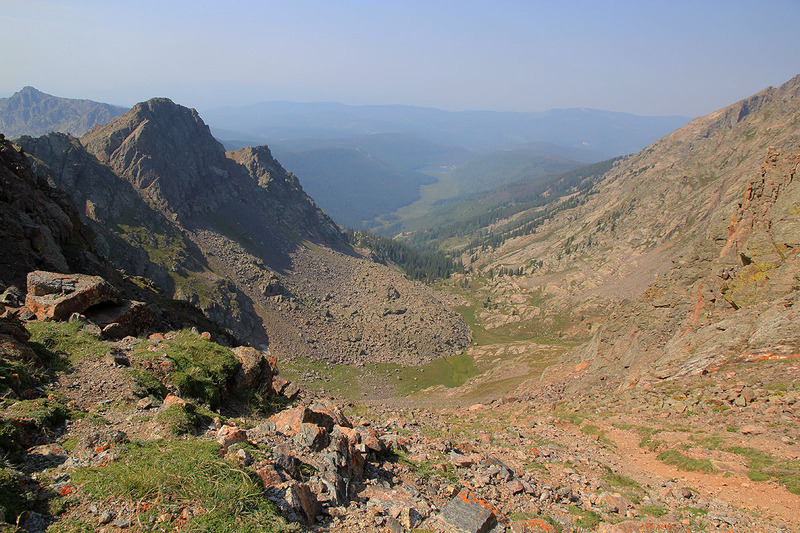 There are several trails in this area, just head uphill as you leave the main valley (it bends sharply right) below and continue heading north-east. The route will reach a somewhat flatter area, sort of overgrown meadow. Cross it and head right until you recover the trail (if you lost it). Continue again more steeply uphill on the left side of the creek, in order to gain a very nice high level basin below Kneeknocker Pass. 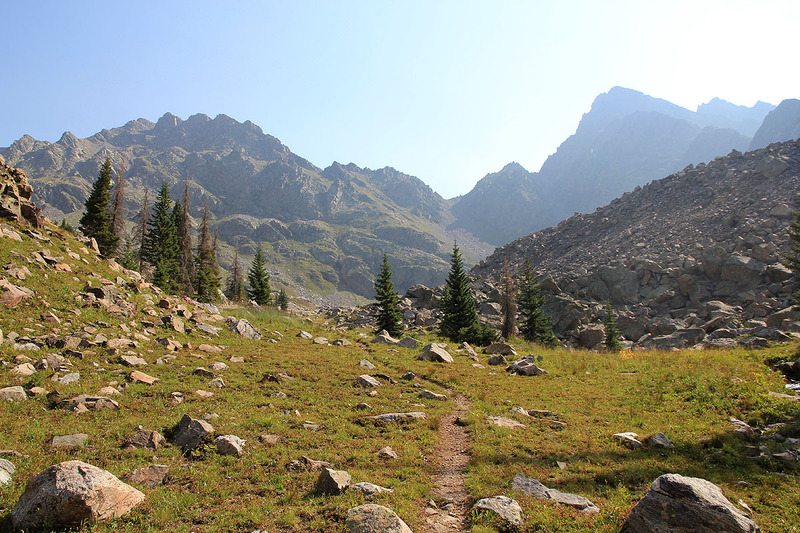 The trail crosses nice grass and then climbs more steeply mostly on the left in order to gain Kneeknocker Pass. This pass is at location N39.75219, W106.34054, almost 3750 meter. Descend a bit on the other side of the pass, possibly by way of a traverse left (loose rocks), to reach bigger boulders below and the base of an obvious gully that will take you almost to the summit of Mount Powell. Climb up this gully, first on grass later more rocks and scree. 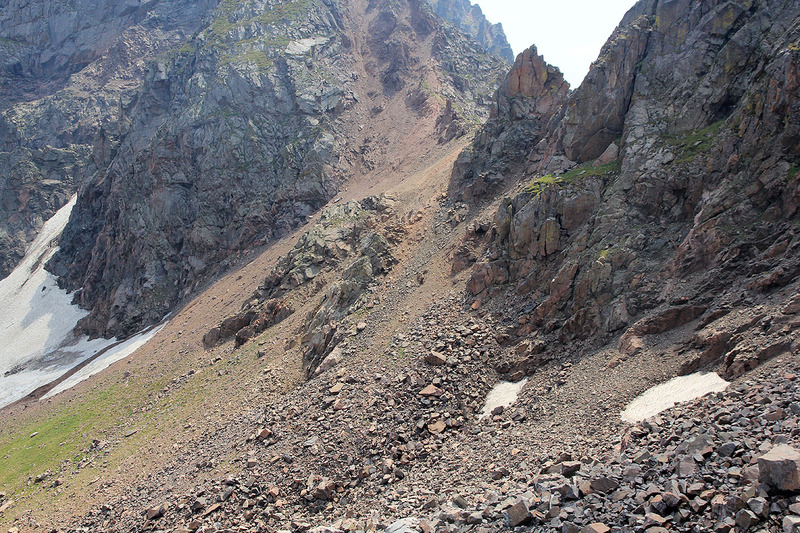 be careful to avoid possible rockfall near the top. Gain the saddle. 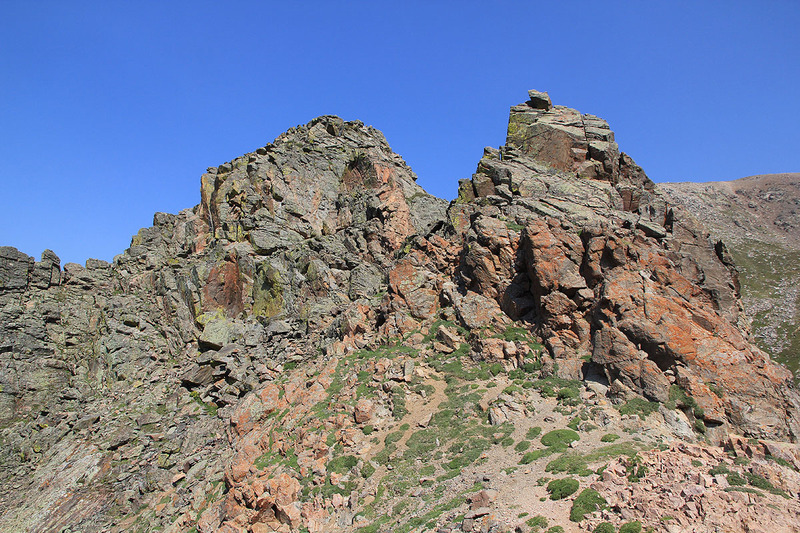 The summit is now to your right, the last short stretch going across bigger rocks. 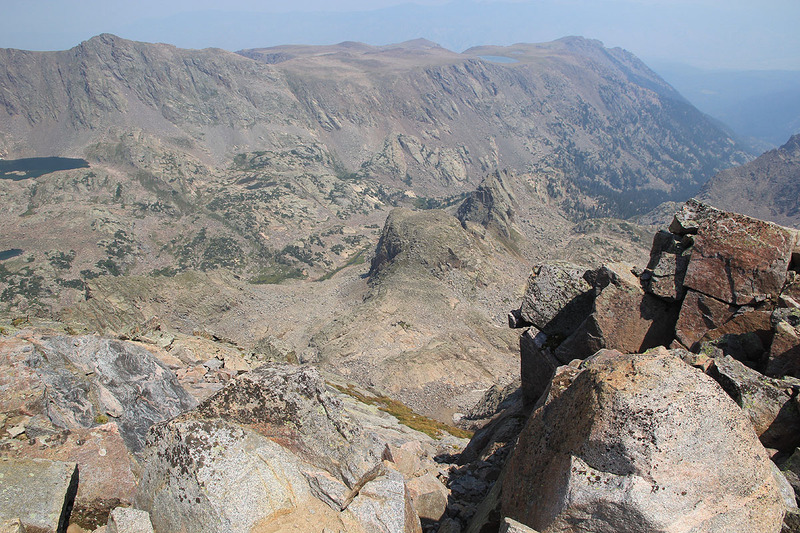 Aim for the local sadlle on your right, then more left to access the highest point of Mount Powell. 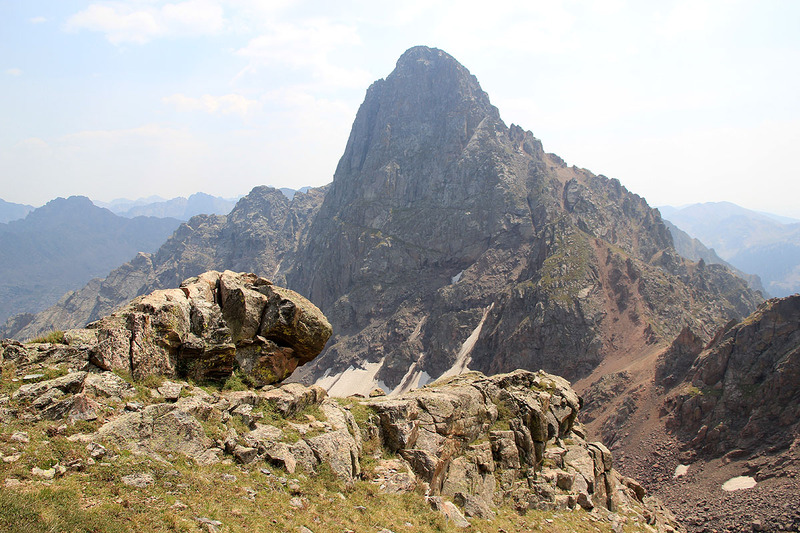 There is a summit register at the top. 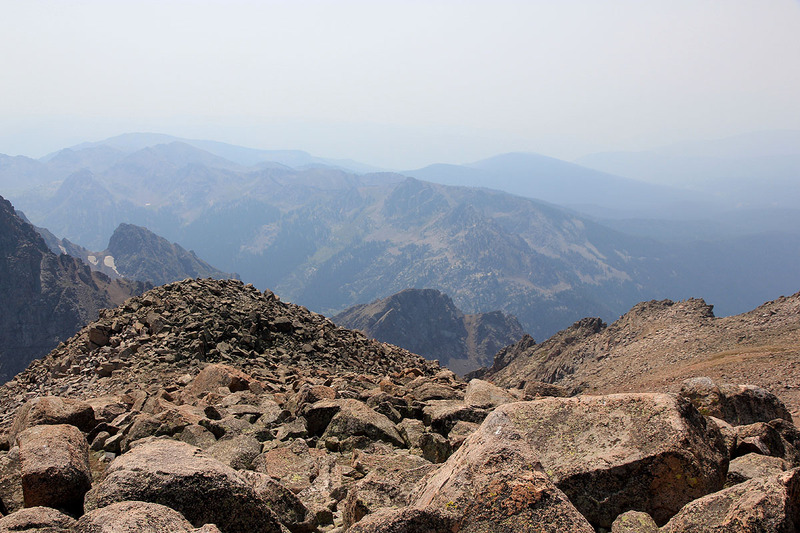 I climbed this peak with Rob Woodall. This was our last peak climbed on a very successful 3 week trip to Colorado, Wyoming and Montana. We left Sverre's place in Lakewood at 0600 and drove to the trailhead in slightly less than 2 hours. Leaving the trailhead at 0800, we enjoyed the nice trail and the very good scenery. 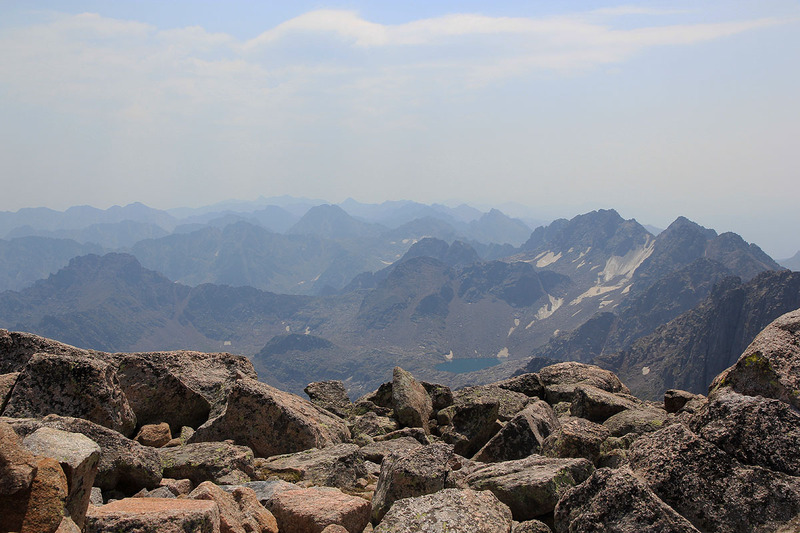 A beautiful mountain valley with lake, creek and aspen trees, then a rugged skyline with ridges characteristic for the Gore range. After about 3 miles, the trail merged back with the Piney Creek, this was where we expected to locate our smaller trail forking left. We never found this, but headed uphill along a pretty obvious trail. 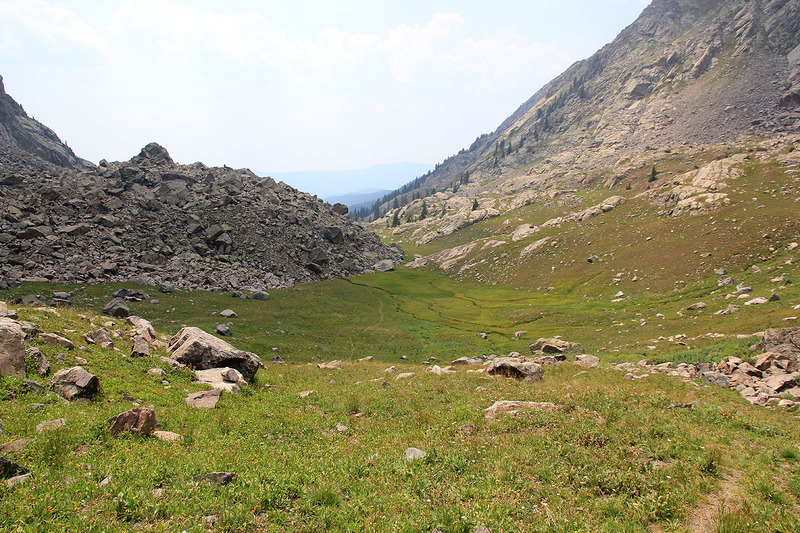 The route became more confused as we crossed an overgrown meadow, but then the very clear trail reappeared right next to the creek that drains this side valley. 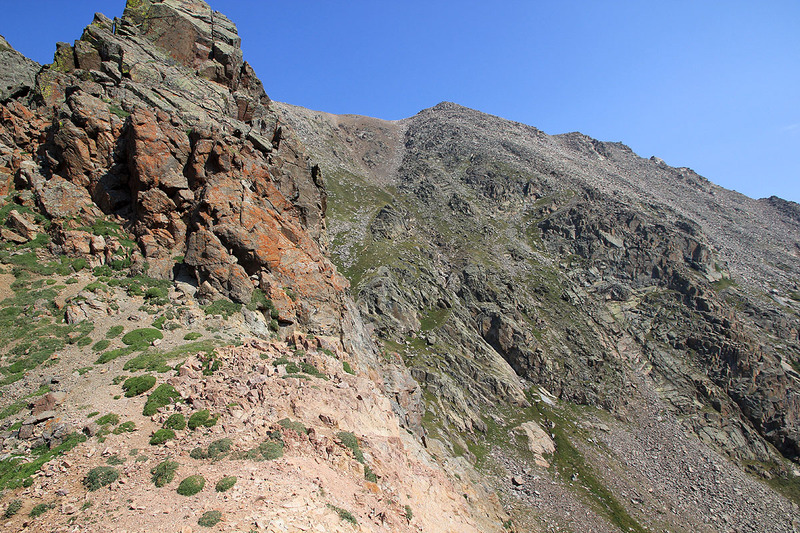 From now, the route was obvious and soon we were above tree line in a very nice alpine basin. The trail continued more steeply uphill and we overtook two hikers that were on their way to fish in a lake below on the far side of Kneeknocker Pass. Quite a long hike to go fishing! It was father and son, the father, Stan Gill, knew Bill Briggs well, small world. 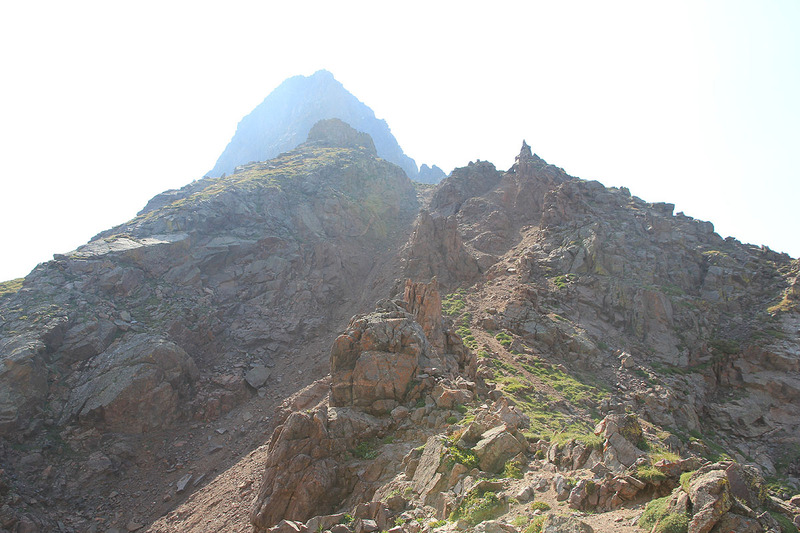 Bill and I went climbing in the Gore Range back in 1997, we visited peak M, peak N and peak O on that trip. We made the Kneeknocker Pass and continued with a descending traverse (left) on loose ground before our final ascent to the summit. BIG scare!! Shortly before the saddle, I was about to enter a small, short gully with big rocks in order to gain the final stretch to the saddle. The rocks seemed completely stable, but immediately as I stepped on the first one, it gave way and (much) worse, 3 more BIG rocks came straight at me from higher up! I immediately knew that this was a life threatening situation. Within half a second, I was hit by one rock in my left thigh, while another one flew by and scratched my head. They all came to rest 2-3 meter below. These flying stones were somewhere between 100 and 200 kilogram each - no joke. Quite shaken, but absolutely still alive, I said to Rob: "I am OK". Given the very serious situation this was accurate. I was bleeding from the top of my head and the side of my head going down to my left ear felt very tender. My left leg had taken a big hit, but the knee and the hip were unhurt. We continued uphill and were soon at the summit. My left leg complained, but I knew it would have to walk back to the trailhead. 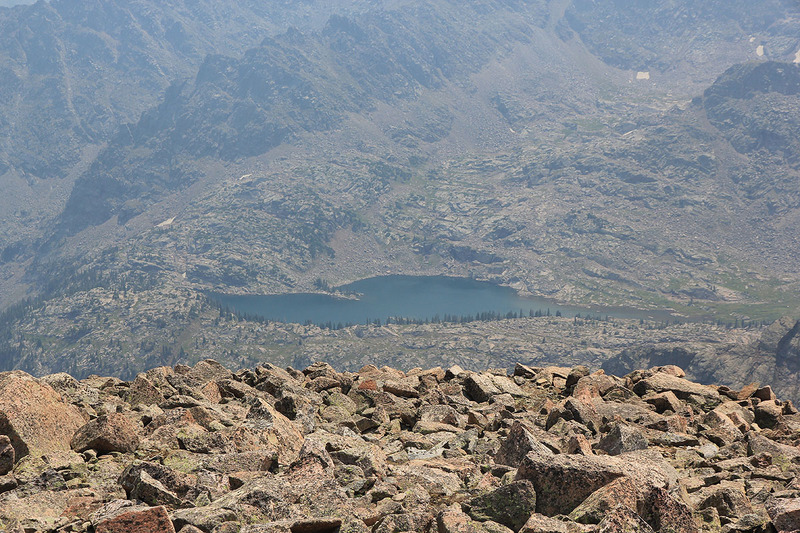 The short distance to the summit was insignificant in comparison. At the summit, we ran into Scott, a young lad that we had been catching up with going uphill. Upon seeing my head bleeding, he immediately grabbed his climbing helment from his backpack. 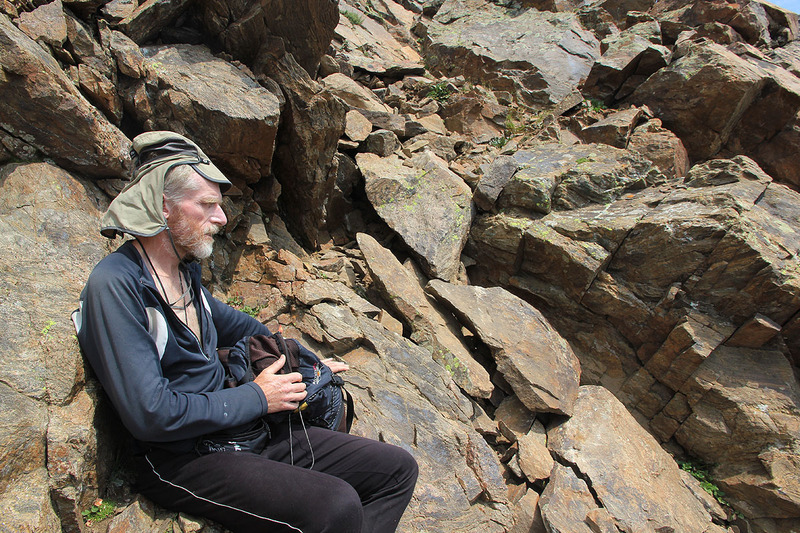 Right at the summit, the danger of falling rock was minimal, but if you carry a helmet you may as well use it where rocks can fall on you. 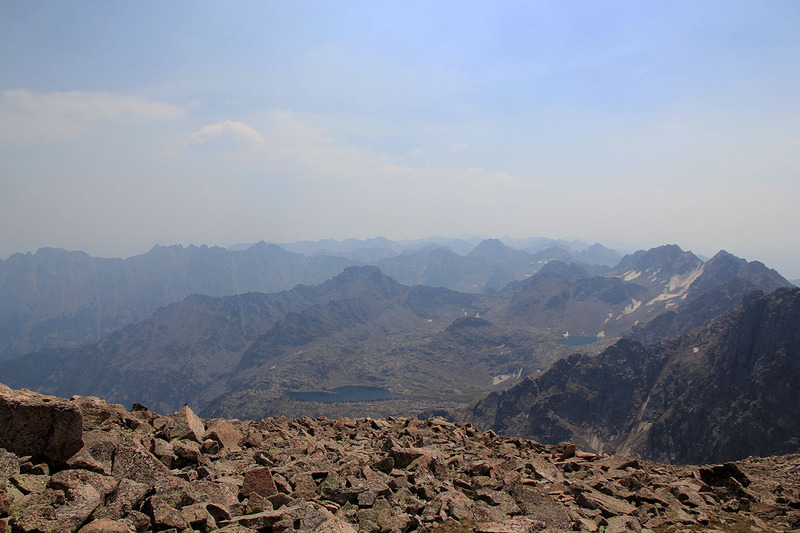 We made the summit at 1210, sat down and admired the Gore range all around. Peak C, the next peak in the sequence, looked very steepish from this side. 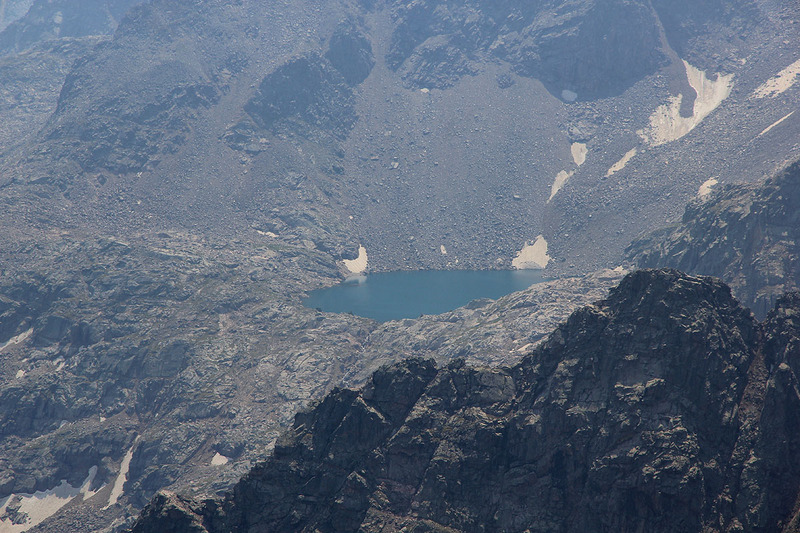 A long way down, we could see the lake where Stan wanted to go fishing. The weather was great, however the views a bit hazy. 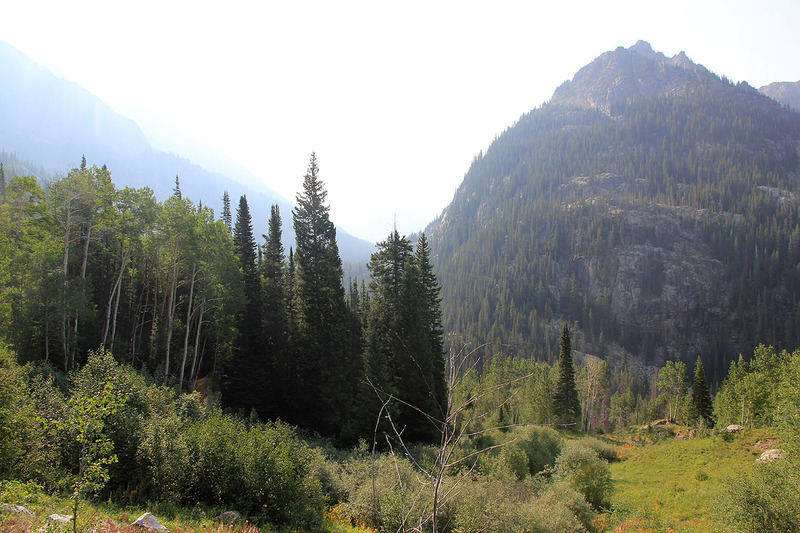 This was due to smoke in the air coming south from forest fires in Wyoming and Montana. (Can be observed in most photos from this trip.) After 30 minutes in great weather, we started back down. To avoid any more incidents, we stayed together with Scott as we descended back down the same route, Peak C growing in size and stature the lower we got. My left leg was stiff and bothered me quite a bit, but fortunately, the trouble did not reduce my hiking speed much. We were back at the car shortly before 1600, a great hike and a fine way to complete our 3 sweek trip. Many thanks to Rob for excellent company! In Kneeknocker Pass, Peak C in the distance. 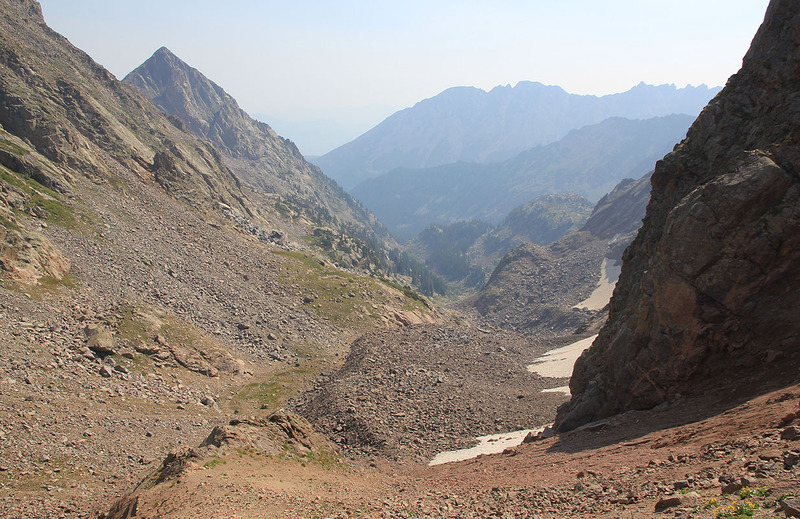 In Kneeknocker Pass, Mount Powell is up to the right. View east from Kneeknocker Pass. View back from Kneeknocker Pass. Kneeknocker Pass. In front of the cloud, Powell up towards the left, Peak C up to the right.